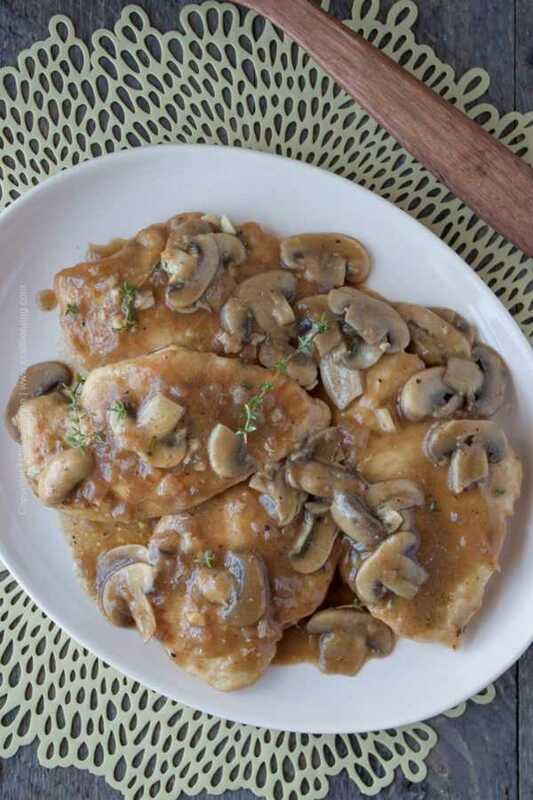 Chicken beersala is our delicious take on the classic dish made with chicken cutlets, mushrooms and Marsala wine. Leave it to us to infuse the amazing flavors of craft beer into a dish:). We take immense pleasure in introducing you to this Perrine original cooking with beer recipe. Chicken beersala is so well suited for winter’s cold, dark evenings. Warming and bursting with flavor it provides a veritable embrace for the palate. And for the soul for that matter. Truth be told, it is good to make during any time of the year, but especially so when it is freezing cold outside. The juicy chicken cutlets (they really do turn out juicy!) smothered in the rich, earthy and silky sauce are equally tempting served over mashed potatoes, angel hair or wild rice. We recommend an extremely food friendly beer style to flavor chicken beersala – Doppelbock. Both boozy and sweet, Doppelbock lagers (Double Bock in translation from German) typically have intense malty presence and alluring toasty notes. Just what you’d want to ‘fold’ into a hearty sauce thickened by flour and turned lustrous by butter. We used Devastator Double Bock brewed by Wasatch Brewery out of Utah – the first craft brewery in the state, started by a mid-Westerner in 1986. They have quite a rogue reputation (imagine starting a brewery in Utah several decades ago!!) and several sinfully good brews that we can now purchase here in Colorado. Devastator is very intense, everything a Doppelbock should be, with light nuttiness and somewhat creamy mouthfeel, which work perfectly for this dish. It has ABV 8% and just traces of an herbal bitterness that supports the earthiness contributed by the mushrooms. Of course, I am partial when I write this, but I prefer the flavors contributed by Doppelbock over those from Marsala. Especially the cooking version of Marsala wine most recipes call for, which has little in common with the fortified drinking wines from Sicily and does not bring the same rich caramelized flavors. If you are really into earthy flavors, you can play them up in this recipe. By all means depart from the white button mushrooms we used for this version of chicken beersala. Go with porcini, or use creminis and add one or two dried shiitakes (reconstituted) and your sauce will be even heartier and nuttier. Most recently Chris cooked up a creamy three mushroom Doppelbock soup with a ton of thyme in it and it tasted soo good that we almost didn’t want to share it with the friends who were staying with us for the weekend, lol. It was tasty, eaten in wooden bowls by the outside fire. Chris should have made a double batch though. And he will:) We commit to making that soup for the blog before winter is over. 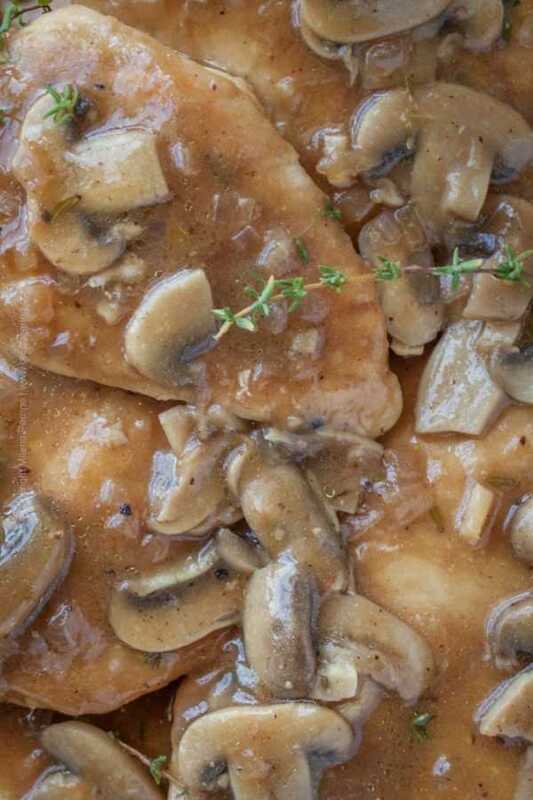 Another quick note – while chicken Marsala is typically garnished with flat leaf Italian parsley, we use fresh thyme for the chicken beersala. Much better combination. Think French onion soup and it’s basic flavor profile. Would you want it to have parsley or thyme? Again…. this Doppelbock based sauce is so rich and satisfying, that we sincerely hope you will try our recipe. Typically I suggest alternative beer styles to use in our recipes, but for the chicken beersala we both feel that Dopplebock is the one that reigns supreme. Don’t deviate, you will be glad you didn’t. Leaving you with the full recipe and this short video (to convince you how easy it is to make a chicken beersala). Cheers, friends! To all the amazing flavors craft beer has to offer as a recipe ingredient. 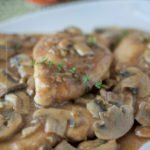 Chicken beersala is a twist on the classic chicken Marsala, with sweet and potent Doppelbock lager replacing the Marsala wine. Garnished with thyme instead of parsley. Rich and creamy savory mushroom sauce covers the chicken cutlets. In a shallow dish mix together the flour and salt and pepper with a fork. Coat both sides of each cutlet in the flour and shake off any excess. Set aside flour coated cutlets. In a large pan over medium high heat melt the butter and add the olive oil. Working in two batches, brown each side of the cutlets for about 2-3 minutes and remove from pan. Set aside the browned cutlets and keep them warm while you prepare the sauce. Add the mushrooms to the same pan and keep the heat on medium high. If you need to, add an extra 1 tbsp of butter. Season with salt and pepper and saute the mushrooms for 2-3 minutes. Add the diced red onion and saute for another 2 minutes. Add the garlic and thyme and stir, saute for 1 more minute. Pour the Doppelbock over the mushrooms to deglaze the pan and gently scrape the brown bits from the pan. Reduce the sauce for about 3 minutes and add the chicken stock. Reduce again (6-8 mins) and return the chicken cutlets to the pan. Lower the heat to medium and let them simmer in the sauce for 5 minutes to cook through. Towards the end of the 5 minutes add 1 tbsp butter and let it melt into the sauce. It will make the sauce creamier. Serve over angel hair pasta, gnocci, long grain rice or mashed potatoes. I have been to your brewery and another one when I was in Utah about 10 years ago. I did like your dark beers and enjoyed the tour. I live on the East Coast and I can’t get your beer here, can you recommend another popular brand I could use instead? It won’t be worth it to have some shipped here as I’m not sure if my state or yours allows it. I can’t drink anymore because of medical issues but adding it to a meal gets the flavor and the alcohol level is cooked away. You can use any Doppelbock to make our Chicken Beersala. Just ask at your local store what they carry in terms of the style. We have used a variety of Doppelbocks to prepare the dish and the results are pretty much similar. Yes, the alcohol gets cooked off and the rich flavors of the beer are concentrated – the sauce is simply delicious! Hope you enjoy! Thank you for stopping by! My eyes opened wider when I saw the beersala recipe. My SIL will definitely appreciate since his family has a brewery in Utica, NY. Thank you for sharing! I bet that beer makes a really good sauce. I love wine, but I think in this recipe the beer would be a different taste that is very suitablle. Looks amazing. We must agree with your assessment:) Doppelbock definitely shines in this recipe. Your Chicken Beersala will be fantastic! Hope you are having a great week and thanks so much for sharing with us at Full Plate Thursday! 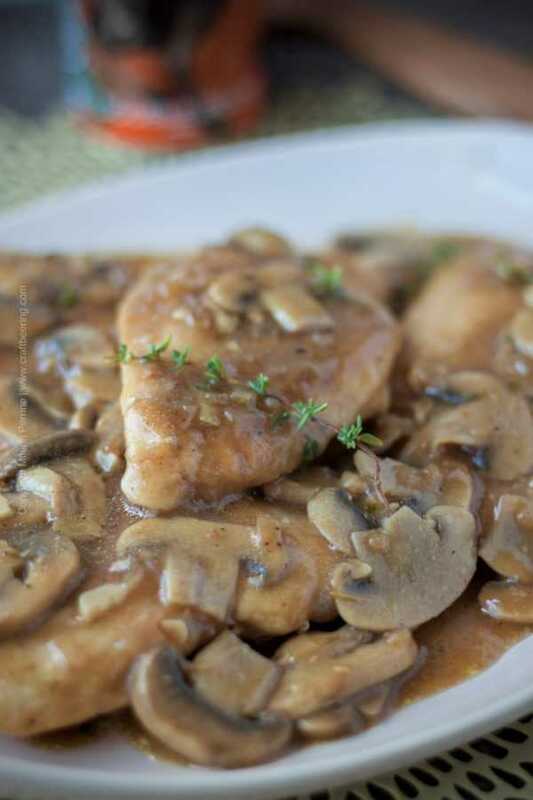 I love chicken marsala; I may have to try this “new” version. Pinned. OMG this looks so good. I was never a huge fan of Marsala sauce. But I can totally see how beer would create a delicious mushroom sauce. Thanks so much for sharing at the #happynowlinkup! I love everything about this chicken beersala! It certainly looks perfect for this time of year and I can only imagine how delicious it is made with doppelbock! Cheers! It’s official! I’m starving! I can imagine that that lager adds a certain joie de vivre!! Loving this classic with a twist! This looks SO good! Did you know I happen to looooove mushrooms? Like, LOVELOVELOVE them. I’m going to pester you until that mushroom soup makes an appearance here :). Until then I’ll just have to eat some chicken beersala. (Which I think might be the best name I’ve ever heard.) Have a great weekend! Did not know about you and mushrooms, Kelsie! Such a tasty thing aren’t they? Mushrooms, butter and beer can get a person closer to food heaven, no doubt about it! Oh well… this is brilliant! 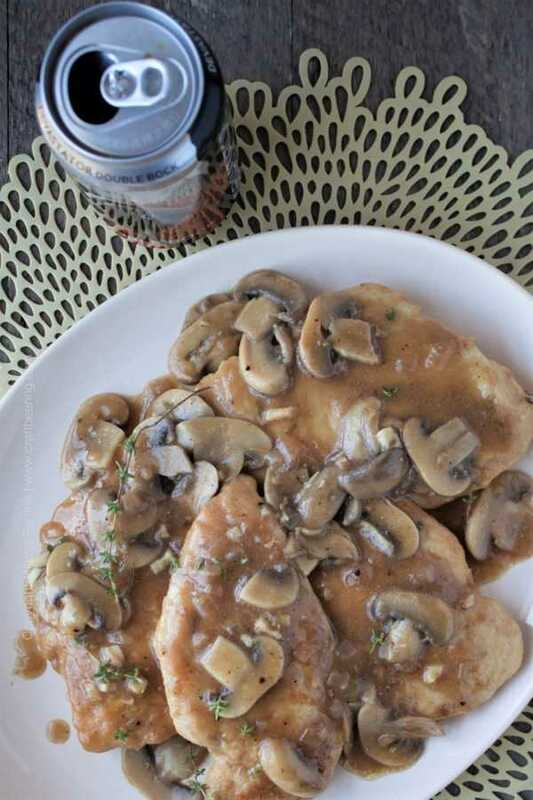 I love Chicken Marsala, but I can totally see how perfectly a good Doppelbock would blend these flavors together. I can’t wait to give this a try – thanks for sharing with Party in Your PJs! So excited to hear you will try it out, Lynda! Doppelbock is really the perfect beer for chicken beersala. I think thyme was a great choice! And I’m absolutely loving this twist. Huge fan of mushrooms over here so this is right up my alley. And that butter to add richness? YES! I can’t wait to see that soup you’re talking about…don’t hold out on us now, will ya 😉 ?? I kinda need that because it’s getting super cold around here lately. Fab job on the video too 🙂 Pinned! Thank you, Dawn! Yes, we do need to make the three mushrooms soup soon. Soo good!